Yorinobu Sumida, Hirotada Akiho, Eikichi Ihara, Kazuhiko Nakamura, Department of Medicine and Bioregulatory Science, Graduate School of Medical Sciences, Kyushu University, Fukuoka 812-8582, Japan. Author contributions: Osoegawa T, Motomura Y, and Higuchi N designed the research; Osoegawa T, Motomura Y, Higuchi N, Tanaka Y, Hisano T, Itaba S, Gibo J, Yamada M, Kubokawa M, Sumida Y, and Akiho H analyzed and interpreted the data; Osoegawa T and Motomura Y drafted the article; Akahoshi K, Ihara E, and Nakamura K revised the article for important intellectual content. AIM: To investigate the clinical outcome of double balloon enteroscopy (DBE)-assisted endoscopic retrograde cholangiopancreatography (DB-ERCP) in patients with altered gastrointestinal anatomy. METHODS: Between September 2006 and April 2011, 47 procedures of DB-ERCP were performed in 28 patients with a Roux-en-Y total gastrectomy (n = 11), Billroth II gastrectomy (n = 15), or Roux-en-Y anastomosis with hepaticojejunostomy (n = 2). DB-ERCP was performed using a short-type DBE combined with several technical innovations such as using an endoscope attachment, marking by submucosal tattooing, selectively applying contrast medium, and CO2 insufflations. RESULTS: The papilla of Vater or hepaticojejunostomy site was reached in its entirety with a 96% success rate (45/47 procedures). There were no significant differences in the success rate of reaching the blind end with a DBE among Roux-en-Y total gastrectomy (96%), Billroth II reconstruction (94%), or pancreatoduodenectomy (100%), respectively (P = 0.91). The total successful rate of cannulation and contrast enhancement of the target bile duct in patients whom the blind end was reached with a DBE was 40/45 procedures (89%). Again, there were no significant differences in the success rate of cannulation and contrast enhancement of the target bile duct with a DBE among Roux-en-Y total gastrectomy (88 %), Billroth II reconstruction (89%), or pancreatoduodenectomy (100%), respectively (P = 0.67). Treatment was achieved in all 40 procedures (100%) in patients whom the contrast enhancement of the bile duct was successful. Common endoscopic treatments were endoscopic biliary drainage (24 procedures) and extraction of stones (14 procedures). Biliary drainage was done by placement of plastic stents. Stones extraction was done by lithotomy with the mechanical lithotripter followed by extraction with a basket or by the balloon pull-through method. Endoscopic sphincterotomy was performed in 14 procedures with a needle precutting knife using a guidewire. The mean total duration of the procedure was 93.6 ± 6.8 min and the mean time required to reach the papilla was 30.5 ± 3.7 min. The mean time required to reach the papilla tended to be shorter in Billroth II reconstruction (20.9 ± 5.8 min) than that in Roux-en-Y total gastrectomy (37.1 ± 4.9 min) but there was no significant difference (P = 0.09). A major complication occurred in one patient (3.5%); perforation of the long limb in a patient with Billroth II anastomosis. CONCLUSION: Short-type DBE combined with several technical innovations enabled us to perform ERCP in most patients with altered gastrointestinal anatomy. Patients who have undergone bowel reconstruction have been considered unsuitable for endoscopic retrograde cholangiopancreatography (ERCP) using conventional endoscopy[1-6]. This is because the endoscopic approach to the afferent loop, blind end, and the choledochojejunostomy site using a conventional endoscope is difficult because of the distance from the gastrojejunal anastomosis site, the unusual anatomical features of the intestine such as its winding form, and postoperative adhesions. Recently, double balloon enteroscopy (DBE) has been reported to be of significant benefit for the diagnosis and treatment of biliary and pancreatic diseases in such patients[7-13]. DBE enables us to advance much deeper into the small intestine than using a conventional push-enteroscope[14-16]. It is still difficult, however, not only to reach the papilla of Vater or the site of choledochojejunostomy, but also to cannulate selectively into the pancreatic and/or biliary duct in ERCP using DBE (DB-ERCP). Therefore, further contrivances including both instrumental and technical innovations have been required to improve the outcome of DB-ERCP. One of the most significant instrumental innovations is a short-type DBE, which has been recently developed, and contributes to increased success rates not only for reaching the papilla and blind end but also for ERCP-related interventions because of its short working length and the availability of various accessory devices[17,18]. There has still been a need for developing the technical innovations to obtain more favorable outcome of the DB-ERCP. This study describes several technical innovations and tips in the use of a short-type DBE to improve clinical outcomes of DB-ERCP. Between September 2006 and April 2011, 48 ERCP procedures were analyzed in 28 patients (10 female, 18 male; age 54-91 years, mean 74.0 years) with pancreatobiliary diseases who had previously undergone bowel reconstruction. The bowel reconstruction methods included Roux-en-Y total gastrectomy in 11 patients (26 procedures), Billroth II gastrectomy in 15 patients (18 procedures), and Roux-en-Y anastomosis with pancreatoduodenectomy in two patients (three procedures). Patients with Roux-en-Y total gastrectomy or Billroth II gastrectomy had naïve papilla (n = 26), and those with pancreatoduodenectomy had hepaticojejunostomy (n = 2). Twenty-eight consecutive postsurgical patients were included in this study after written informed consent was obtained. We used short-type DBE, EC-450B15 (Fujifilm, Saitama, Japan). The DBE system is a high-resolution videoendoscope with a flexible overtube. The videoendoscope has a 2.8-mm working channel and a working length of 1520 mm, and a detachable balloon at its tip. It is used with a soft overtube measuring 1050 mm in length with another balloon at the distal end. The endoscope and overtube balloons are made from latex, which is 0.1 mm thick and very soft. The balloons can be inflated or deflated by a specially designed air pump controller with one-touch controls, while monitoring the air pressure. A soft transparent hood (DH-17EN; Fujifilm) was attached to the tip of a scope in all procedures. All procedures were performed during conscious sedation by giving 35 mg pethidine hydrochloride and 0.5-2 mg of flunitrazepam intravenously. Scopolamine butylbromide was only used after reaching the end of the afferent loop. DBE was performed using a standard technique as described by Yamamoto et al , Kita et al and May et al , and DB-ERCP was carried out as follows. When an endoscopist was not sure whether the endoscope was in the afferent loop, selective contrast enhancement in the intestine was performed with a balloon inflated on the endoscope tip, allowing the endoscopist to confirm the direction of the afferent loop under fluoroscopy[17,18]. Although formerly we used standard air insufflations during the procedure, since April 2009 we have used CO2 instead of standard air insufflations to improve intubation depth during DBE, as well as to reduce postprocedural pain . In the first procedure, the beginning of the Roux limb was marked by submucosal tattooing (Indian ink) in patients with a Roux-en-Y anastomosis (Figure 1). The time taken for this procedure and the whole procedure was recorded. Figure 1 In the first procedure, the beginning of the Roux limb was marked by submucosal tattooing in patients with a Roux-en-Y anastomosis. 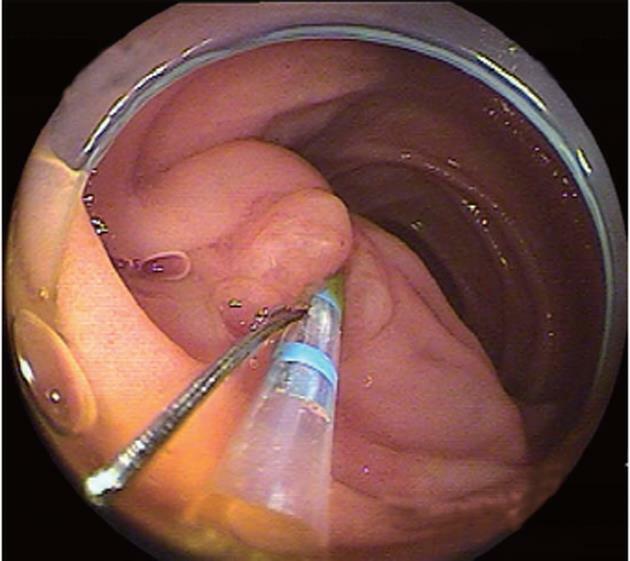 Once the endoscope reached the papilla or ductal anastomosis, appropriate stabilization of the enteroscope with the overtube and/or enteroscope balloon was often required prior to ERCP. Using DBE, the endoscopist could stabilize the endoscope by the deep insertion of an overtube, and immobilize the intestine in a position that allowed the bile duct to run in the 11 o’clock direction, as in the conventional ERCP view. A soft transparent hood was attached to the tip of a scope in all procedures. The attachment hood was useful to fix the ampulla (Figure 2). Selective biliary cannulation was achieved using a standard cannula or, if necessary, a sphincterotome (Autotome RX49; Boston Scientific, Tokyo, Japan) with a tip rotatable through 360° (Figure 3). Guidewire (Jagwire 0.035; Boston Scientific) was preloaded into the cannula or sphincterotome, and was placed in the bile duct after successful cannulation for the following procedure. Endoscopic sphincterotomy (EST) was performed using a sphincterotome with rotatable tip or a precutting knife (Single Use 3-Lumen Needle knife V KD-V441M; Olympus, Tokyo, Japan). When EST was difficult, endoscopic papillary balloon dilation was performed with an 8- or 10-mm balloon dilation catheter (Hurricane RX 4594; Boston Scientific). When the opening of the choledochojejunostomy was stenotic, balloon dilation using either an 8-10-mm balloon dilation catheter or 12-mm balloon catheter (CRE Wireguided Balloon Dilatation Catheter 5842; Boston Scientific) was performed. Figure 2 A soft transparent hood (DH-17EN; Fujifilm) was attached to the tip of a scope in all procedures. Figure 3 A sphincterotome with rotatable tip (Autotome RX49; Boston Scientific) was also useful for cannulation in some cases, in which biliary cannulation was unsuccessful with a standard cannula. Stone extraction was performed with a six-wire basket (MTW) or a mechanical lithotripter (Xemex crusher catheter; Zeon Medical, Tokyo, Japan). After the stones were removed, a retrieval balloon catheter (Extractor; Boston Scientific) was used with a guidewire to confirm that no small stones remained. In patients with the bile duct winding at sharp angles where the mechanical lithotripter could not be inserted, and in patients with a bulky stone that could not be extracted in one attempt, a 7-Fr plastic stent (Flexima Biliary Stent System 3920; Boston Scientific) was positioned. All data are expressed as mean ± SE, if applicable. Statistical analyses were performed with JMP statistical software (Version 9.0). Pearson’s χ2 test was performed to compare the success rate of DB-ERCP among Roux-en-Y total gastrectomy, Billroth II reconstruction, and pancreatoduodenectomy. An analysis of variance followed by Tukey’s multiple comparison test was carried out to determine statistical significance among these three groups. A value of P < 0.05 was considered statistically significant. Twenty-eight patients had a total of 47 sessions of DBE. Deep insertion of an endoscope to the papilla of Vater was successful in 24 out of 25 procedures (96%) in patients with Roux-en-Y total gastrectomy, in 18 out of 19 procedures (94%) in patients with Billroth II reconstruction, and in all three procedures in patients with pancreatoduodenectomy (Table 1). There were no significant differences in the success rate of reaching the blind end with a DBE among Roux-en-Y total gastrectomy, Billroth II reconstruction, and pancreatoduodenectomy (P = 0.91). DBE can be a very useful modality for patients with altered gastrointestinal anatomy irrespective of surgical procedures. Table 1 Success rate of double balloon enteroscopy-assisted endoscopic retrograde cholangiopancreatography n (%). Overall, the rate of successful cannulation and contrast enhancement of the target bile duct was 40 out of 45 (89%) in patients in whom the blind end was reached; this was made up of 21 out of 24 procedures (88%) in Roux-en-Y total gastrectomy patients, 16 out of 18 procedures (89%) in Billroth II patients, and all three procedures in patients with pancreatoduodenectomy. Again, there were no significant differences in the success rate of cannulation and contrast enhancement of the target bile duct in patients whom the blind end was reached with a DBE among Roux-en-Y total gastrectomy, Billroth II reconstruction, and pancreatoduodenectomy (P = 0.67). Treatment was achieved in all 40 procedures (100%) in patients in whom contrast enhancement of the bile duct was successful. The 40 treatment procedures are listed in Table 2, and the details of treatment are given in Table 3. The most common endoscopic treatment was endoscopic biliary drainage (24 procedures), which was done by placement of plastic stents. Extraction of stones (14 procedures) was done by lithotomy with the mechanical lithotripter followed by extraction with a basket or by the balloon pull-through method. EST was performed with a needle precutting knife using a guidewire (14 procedures). The choledochojejunostomy site was dilated by balloon in three procedures. Table 2 Treatment procedures for double balloon enteroscopy-assisted endoscopic retrograde cholangiopancreatography. BD: Balloon dilation; SE: Stone extraction; EST: Endoscopic sphincterotomy. Table 3 Detailed treatment procedures for double balloon enteroscopy-assisted endoscopic retrograde cholangiopancreatography. EBD: Endoscopic biliary drainage; EPD: Endoscopic pancreatic duct drainage. The mean total duration of the procedure was 93.6 ± 6.8 min. The mean time required to reach the papilla was 30.5 ± 3.7 min. For a subanalysis, the time required to reach the papilla of Vater was 37.1 ± 4.9 min in Roux-en-Y total gastrectomy, 20.9 ± 5.8 min in Billroth II reconstruction, and 33.3 ± 13.4 min in pancreatoduodenectomy. It tended to be shorter in Billroth II reconstruction than that in Roux-en-Y total gastrectomy but there was no significant difference (P = 0.09). DB-ERCP seemed to be technically more difficult in patients with Roux-en-Y total gastrectomy than those with Billroth II reconstruction. A major complication occurred in one patient (3.5%); perforation of the long limb in a patient with Billroth II anastomosis. Perforation occurred during insertion of DBE in this patient’s second session. The perforation was successfully resolved surgically. No post-ERCP pancreatitis occurred. The invention of DBE has dramatically changed the endoscopic management of pancreatobiliary diseases in patients who have undergone bowel reconstruction[8-12]. DBE has made it possible to reach the papilla or biliopancreatoenteric anastomosis site even in patients with Roux-en-Y surgical reconstruction. Although patients who have undergone Billroth II reconstruction are considered capable of undergoing ERCP with a conventional endoscope, the endoscopic approach to the afferent loop, blind end, and the site of hepaticojejunostomy is difficult in cases where there are severe adhesions or a long afferent loop. In such patients with Billroth II reconstruction, DB-ERCP is effective. DB-ERCP has three major steps; the first step is intubation to the papilla or the site of hepaticojejunostomy, the second is cannulation into the bile and/or pancreatic duct, and the third is therapeutic manipulation such as sphincterotomy and/or stone extraction. There have been several reports of DB-ERCP. Although the success rates of reaching the papilla or of cannulation for intact papilla are high (50%-100%, 67%-100%, respectively)[17,18,20-22], they are still lower than for conventional ERCP. Therefore, technical difficulties or instrument limitations are considered likely. Some useful techniques or endoscopic accessories have been reported for conventional endoscopy or DBE, however, there are few reports which describe in detail the technique or the instruments for each step of DB-ERCP. We describe these things in detail, because they may contribute to improving the outcome of DB-ERCP. For the first step, intubation to the papilla or the site of hepaticojejunostomy, short-type DBE may be recommended. Originally, double balloon enteroscopes were 200 cm long, which did not cause a problem with insertion into the papilla, but limited the number of devices for the ERCP procedure[17,18,20,21]. Short-type DBE, which was originally developed for colonic insertion, has resolved this problem[17,18]. Shimatani et al have reported that because of its short working length and the availability of various accessory devices, short-type DBE increases the success rates for reaching the papilla and blind end, and for ERCP-related interventions. Cases in which double balloon enteroscope insertion may be difficult are patients who have jejunojejunostomy such as Roux-en-Y anastomosis or pancreatoduodenectomy. Selective contrast enhancement in the intestine with a balloon inflated on the endoscope tip is useful to confirm the direction of the afferent loop [17,18]. Once the correct way is confirmed, submucosal tattooing at the beginning of the Roux limb may be useful for later sessions (Figure 1)[12,17,21,23,24]. In our series, the blind end was reached in 45 out of 47 procedures (95.7%) with short-type DBE, comprising 18 out of 19 procedures in Billroth II patients, all three in pancreatoduodenectomy, and 24 out of 25 procedures in Roux-en-Y patients. One procedure in Billroth II patients was aborted because of perforation of the long limb, and one in the Roux-en-Y group failed because of strong adhesion. We have used CO2 instead of standard air insufflations since April 2009 to improve intubation depth during DBE, as well as to reduce postprocedural pain. The mean duration for reaching the blind end using CO2 insufflation in Roux-en-Y patients tended to be shorter than that using air insufflation, although the difference was not significant (P = 0.18, 40.9 min vs 29.4 min, air vs CO2, respectively). CO2 insufflation could be useful especially in patients with Roux-en-Y total gastrectomy where DB-ERCP seems to be technically difficult compared to Billroth II reconstruction. The second step, deep cannulation into the bile and/or pancreatic duct, is an important precondition for later therapeutic manipulations. In patients with Roux-en-Y reconstruction, the position of the papilla may vary and may be observed by moving the screen in various directions. The manipulation of both the overtube and the endoscope makes it possible to change the position of the papilla in the view field. Double balloon enteroscopes are not provided with an elevator, therefore, cannulation may be difficult, but the attachment hood is useful to fix the ampulla and to align the axes of the cannula and the bile duct, enabling safe endoscopic procedures and selective pancreatic and/or biliary cannulation (Figure 2). We usually use a normal ERCP catheter. If the biliary axis does not fit, we use a sphincterotome with a rotatable tip (Figure 3). Needle-knife precut papillotomy was performed when the conventional biliary cannulation promised to be difficult, as described by Fukatsu et al. In this study, cannulation was successful and contrast enhancement of the target bile duct was achieved in 40 out of 45 (89%) patients in whom the blind end was reached. There were difficult cases in Roux-en-Y patients (21/24, 88%) and in Billroth II patients (16/18, 89%). It was easy in all three patients with pancreatoduodenectomy. The third therapeutic step is the endpoint of the DB-ERCP procedure. Deep insertion and placing the guidewire into the biliary and/or pancreatic duct is indispensable for the following procedures. Guidewire stabilizes the papilla and makes it easy to perform sphincterotomy or insert the devices into the duct. Treatment was achieved in all 40 procedures in patients in whom contrast enhancement of the bile duct and guidewire placement were successful. Endoscopic biliary drainage by placement of plastic stents was not difficult. However, the diameter of the stents was limited to < 7 Fr. Sphincterotomy using a sphincterotome is sometimes difficult in DB-ERCP. A rotatable sphincterotome or needle precutting knife may be useful in such cases. If sphincterotomy is impossible or insufficient, balloon dilation should be performed. Extraction of stones was done by lithotomy with the mechanical lithotripter followed by extraction with a basket or by the balloon pull-through method. A few types of mechanical lithotripters and baskets that can go through the DBE working channel are commercially available at the present time. However, most of them do not have the wire-guided mechanism, which means it is sometimes difficult to insert into the duct. DB-ERCP complications in patients who have undergone bowel reconstruction have featured in a limited number of reports. Perforations or emphysema at the time of insertion of an endoscope or endoscopic sphincterotomy have been reported in 2.3%-11.1% of cases. Raithel et al have reported post-ERCP pancreatitis in 2.3% and post-interventional bleeding in 1.1% of patients. In our study, complications occurred in only one patient (3.5%); perforation of the long limb in a patient with Billroth II anastomosis[17,18,21]. With regard to the insertion of an endoscope and shortening of the intestinal tract, attention should be paid to avoid forced insertion or shortening, which may cause perforation. In conclusion, short-type DBE combined with several technical innovations enabled us to perform ERCP and ERCP-related interventions in a number of patients for whom it was previously impossible. Endoscopic tattooing at the beginning of the limb, using an attachment hood, and CO2 insufflation might facilitate intubation of the papilla and reduce the duration of the procedure. Cannulation into the bile or pancreatic duct is the most difficult part of DB-ERCP. Using an attachment hood and/or a rotatable sphincterotome may facilitate the procedure. Further instrumental improvements such as the widening of the DBE working channel or development of the accessories for use in balloon enteroscope systems are necessary to improve the outcome of DB-ERCP. The author thanks Mr. Steve Cotton for English editing. Patients who have undergone bowel reconstruction have been considered to be difficult for endoscopic retrograde cholangiopancreatography (ERCP) using conventional endoscopy. Double balloon enteroscopy (DBE) has brought a significant benefit for performing ERCP in patients with such an altered gastrointestinal anatomy. However, there are still some technical difficulties to be resolved. Recently developed short DBE contributes to increased success rates for reaching the papilla and for ERCP-related interventions in DBE-assisted ERCP (DB-ERCP). In the area of DB-ERCP, the research hotspot is how to improve its results for completing therapeutic interventions such as stone extraction and stent insertion of the pancreatobiliary system. Although a short DBE is more useful than a conventional long DBE, clinical outcomes of DB-ERCP are still unsatisfactory compared to conventional ERCP. DB-ERCP has three major steps: intubation to the papilla or the site of hepaticojejunostomy, cannulation into the bile and/or pancreatic duct, and therapeutic manipulation. 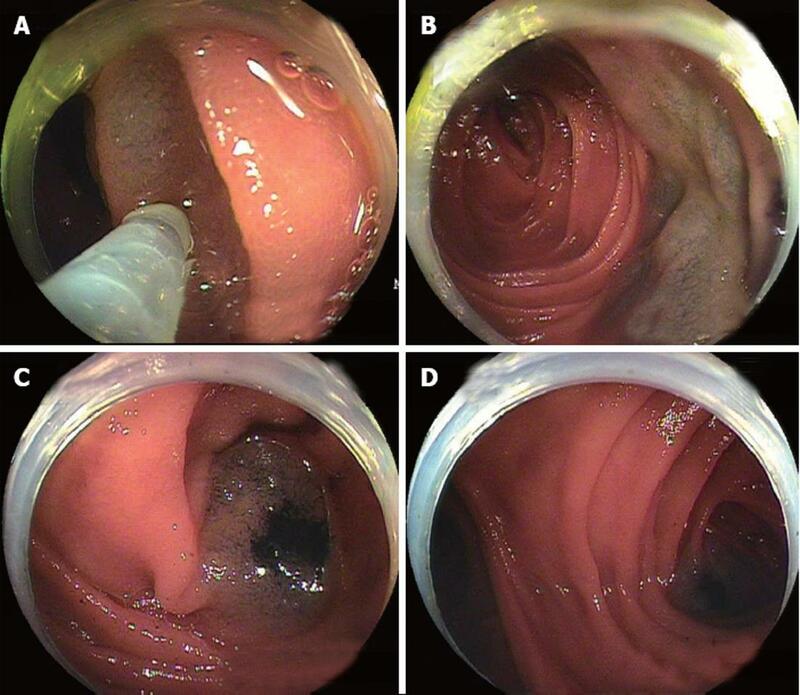 To improve intubation, the authors used CO2 instead of standard air insufflations, selective contrast enhancement in the intestine with a balloon inflated on the endoscope tip to confirm the right direction, and submucosal tattooing in patients with Roux-en-Y anastomosis for the next session. To improve cannulation, we attached a soft transparent hood to the tip of a scope, and used a sphincterotome with a rotatable tip. To improve therapeutic manipulation, we performed guidewire placement into the biliary/pancreatic duct, and needle-knife precutting and/or balloon dilation to make a large enough opening of the orifice. In this study, the authors showed the possibility that short-type DBE combined with several technical innovations enabled us to perform ERCP and ERCP-related interventions more efficiently in a number of patients with altered gastrointestinal anatomy for whom it was previously impossible. DBE has been developed for visualization of and intervention in the entire small intestine. Currently, two types of double-balloon endoscope are available including a conventional type (200 cm working length) and a short type (152 cm). Short-type DBE has great practical use because of its short working length and the availability of various accessory devices. Roux-en-Y reconstruction of the small bowel is a general surgical technique in gastrointestinal oncology surgery, hepatobiliary and pancreatic surgery, and bariatric surgery. For the endoscopist, accessing the ampulla is technically difficult in a patient needing Roux-en-Y reconstruction, because of the long length of bowel that the endoscope must pass through, and the acute angle of the afferent limb and Roux limb anastomosis. This is an important paper describing difficult ERCP cases after gastric surgery. This is a useful report of DB-ERCP techniques. The authors’ modifications of the technique are particularly helpful.